We sincerely applaud your efforts to bring the world’s attention to the dire predicament known as Global Climate Change. Truly, Global Climate Change (GCC) is the most challenging existential threat of our times. Some even describe it as a slow-motion ELE (Extinction Level Event). Therefore, the true causes of such a demanding and unrelenting planetary crisis must be properly investigated. Only when high integrity research produces irrefutable conclusions, should the accurately determined results and scientific consensus be distributed to all concerned stakeholders. Likewise, the final product of this GCC fact-finding mission ought to be disseminated via the internet to every concerned resident of Planet Earth. Which brings us to the urgent purpose of this open letter. According to hard scientific evidence, some of which has been submitted to Governor Jerry Brown of California, it appears that the regular IPCC research and reporting on this matter has ignored a major component of GCC. As the subject title of this letter indicates, that component is GEOENGINEERING. In fact, there are those GCC investigators who now assert that geoengineering may be the primary anthropogenic component of Global Climate Change, not CO2. We feel it is well worth repeating that, only when the true root causes of GCC have been scientifically proven and received a sufficient consensus, should they be used to formulate an official response. However, all of the most essential conclusions must be first acknowledged and agreed upon by the world community of nations. 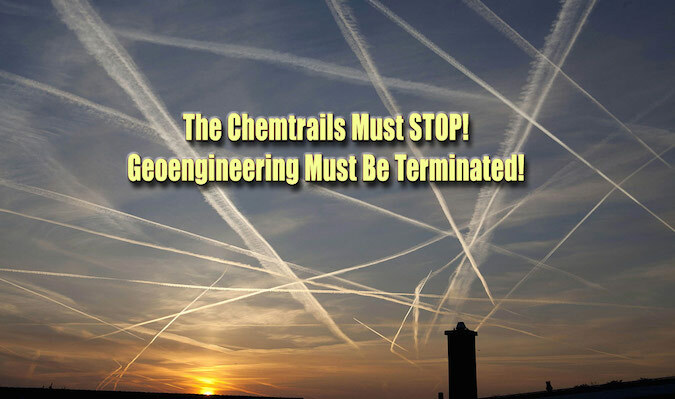 Only when the profound and pervasive causes of GCC, such as the now ubiquitous geoengineering program utilizing chemtrails, are eliminated by every reasonable means necessary will the planet move in the right direction. The current global geoengineering regime can only exist with the tacit approval of a large majority of nations. Obviously, the world’s most experienced geoengineers have been enlisted by those who rule the realm to implement this quite purposeful endeavor. Hence, these covert military chemtrailing operations can only proceed with the full knowledge and acquiescence of thousands of government officials and political leaders the world over. In the USA alone, there are those many NASA administrators, NOAA scientists, NWS meteorologists, FEMA directors and University-based geoengineers who play substantial roles in this ongoing climate engineering drama. Therefore, it is self-evident that Italy has also permitted these unlawful operations to be conducted overhead. Perhaps the appropriate Italian officials can be consulted by Your Holiness for further edification. 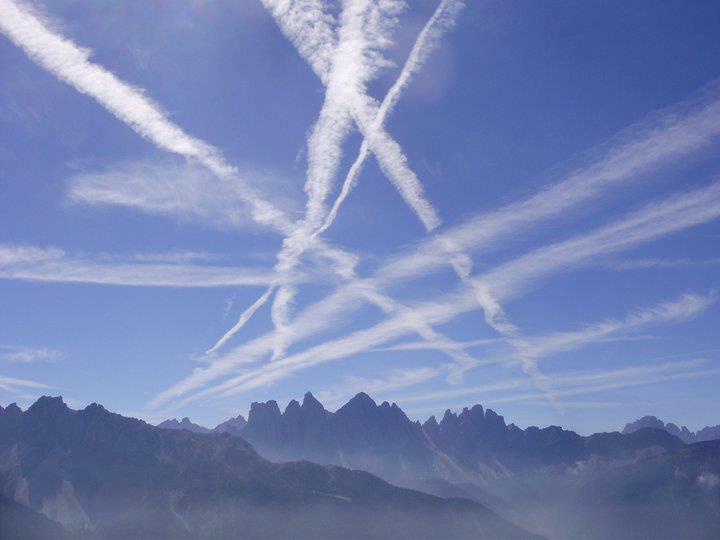 Incidentally, Italian environmental activist and health advocacy groups have been leading the way throughout Europe where it concerns raising chemtrail and geoengineering awareness. For example, the following Italian Facebook site will enable you to follow geoengineering developments in Romagna, Italy. The photo shown below comes from the same FB page. We don’t mean to be presumptuous, but surely you must know …. Pope Francis, certainly you have been informed by now that the intensity of the most recent phase of GCC has been the direct result of this secret, ongoing, multinational geoengineering initiative. Only such a coordinated international implementation plan to systematically conduct ‘solar radiation management’ could have produced our current chaotic state of affairs. 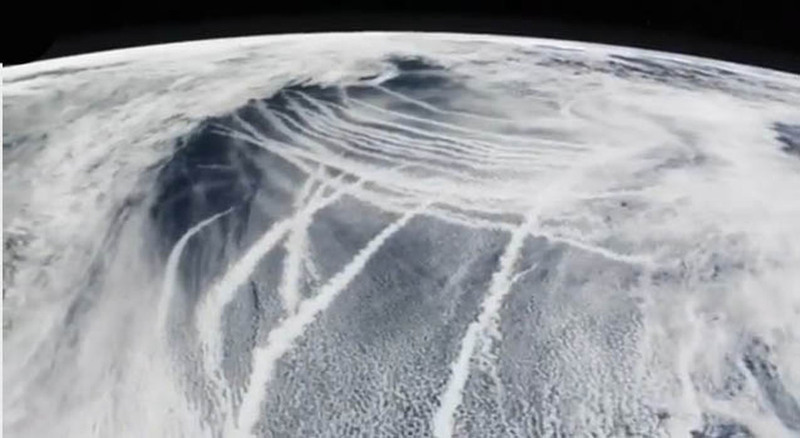 The standard stratospheric engineering techniques, such as sky chemtrailing, are now so apparent that it is impossible to not witness them occurring in real time virtually anywhere around the globe. In the event, however, that you are somehow unfamiliar with geoengineering and/or chemtrails, the following photo-documentary will quickly bring you up to speed. You might also google either term to learn much more about these climate-altering technologies and weather-changing aerosols. Please do understand that the photographs posted in the link below are chemtrails, NOT the normal jet exhaust known as contrails. 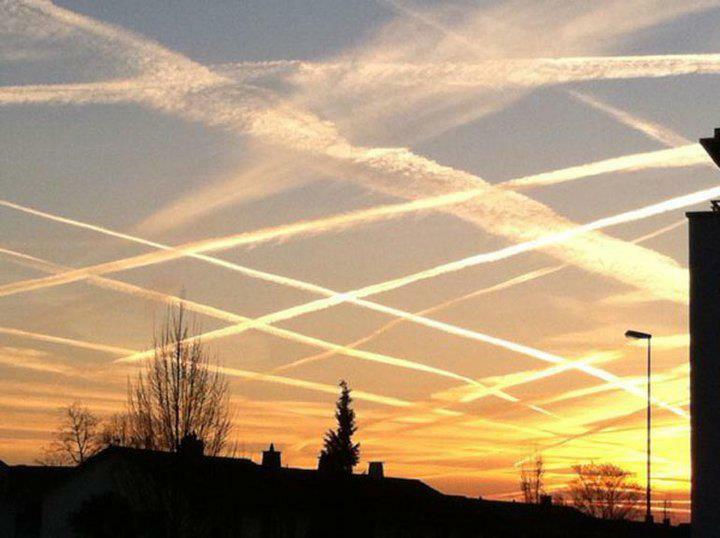 Upon viewing the numerous photos of chemtrails it is now impossible for anyone to deny their existence. Many now see them in the skies all over the world. 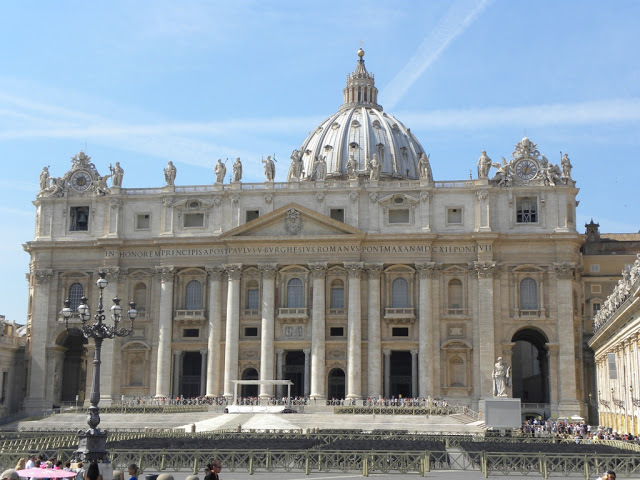 The photo below of Saint Peter’s Basilica in Rome shows a few chemtrails that had been recently sprayed. Those particular chemtrails are just beginning to spread out as they usually do just before they form full-blown chemclouds. Given your master’s degree in chemistry it ought to be fairly easy for you to understand the science and technology which are routinely utilized in most of these geoengineering programs. Not only are chemtrails now being laid down in the skies across the planet more frequently, since January of 2015 chemtrailing operations have intensified considerably with greater purpose so the world has been told. The following article offers some unique and valuable insights into this clandestine geoengineering regime that has been in place for decades. For your further edification on this matter, what follows is a definitive video presentation with Italian subtitles which can be circulated around the Vatican. It portrays irrefutable evidence of jet airliners spraying chemtrail aerosols at will. This particular video captures the chemtrailing airliners in the act of turning on and off their specialized chemtrail aerosol equipment. It’s a very short video which we hope the entire Roman Curia will watch before any future climate change conferences that are sponsored by Your Holiness. Vatican City, as you know, is by no means immune to chemtrail contamination, particularly when they conduct intensive spraying operations over Rome, as they often do over major cities everywhere. In view of this relatively new reality of living on Planet Earth, we would respectfully recommend that you review the various medical conditions and health impacts which are caused by consistent exposure to the chemical toxicities associated with chemtrails. The following article was written by a health professional with much experience concerning a novel illness known as Chemtrail syndrome. Before we reiterate the central point of this open letter, the following statements must be considered in any comprehensive discussion of GCC. — That Global Climate Change actually has multiple causes. — Those causes range from unprecedented changes in the Sun’s behavior to the Earth’s core spinning faster. — The anthropogenic component also has various sub-components. — An increase in CO2 emissions since the advent of the Industrial Revolution cannot be minimized. Neither can the carbon footprint of every person, family, community and business on the planet. Nonetheless, those universities and research institutions, governments and corporations, which have conducted the most frequently referenced research studies, have conveniently ignored the influence of geoengineering on climate trends and weather patterns. This well-established record of intellectual negligence is very similar to the local meteorologist who unfailingly neglects to mention why his weather forecast for the previous day was 100% wrong … because he could not factor in the ‘nonexistent’ chemtrailing activity throughout his local reporting area which made his predictions look ridiculous and flawed. Because the “pink elephant in the living room” known as geoengineering has been ignored for so many years, its imposed ‘non-existence’ has become a politically correct fact of life. Clearly, that’s exactly how those who control the weather want it to be. In this way, quite unfortunately, has the phenomenon of Global Climate Change been grossly exacerbated since it first began to reveal itself a number of decades ago. The following excerpt comes from an article written by the Cosmic Convergence Research Group published in June of this year. This insightful exposé well explains “The Back Story” to our current climate change plight. This is what TPTB* did. They saw that the planet had entered a period of global warming. 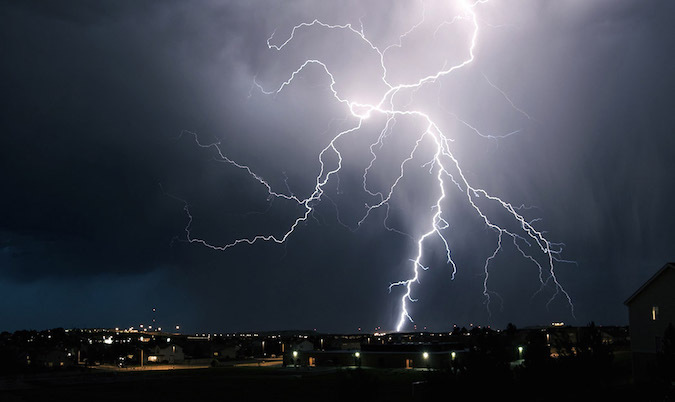 This occurred during World War II when they had to track the weather very closely for wartime purposes. The steady warming of the planet paralleled the same period when the Oil & Gas Industry really began to take off and the global population explosion first began. At the time when the data really started to pour in, the warming was just a small campfire … this was early on, right after World War II. Soon after they first made those observations about the slow warming of the planet, the decision was made to turn the campfire into a wildfire. They experimented with HAARP and used Chemtrails and other geoengineering technologies to ramp up the heat. Eventually the wildfire of global warming was stoked sufficiently so that full-blown forest fires, brush fires and grass fires were jumping off anywhere and everywhere. In this way the synthetic anthropogenic component Global Warming was fabricated on top of a very real phase of planetary heating. It’s extremely important to understand what really happened here. Rather than address the root causes of GCC, those in charge attempted to control the increasingly erratic weather much like an oncologist who prescribes surgery, radiation and chemo to treat a raging case of pancreatic cancer. You know, if the pancreatic cancer doesn’t first kill the patient the allopathic treatment(s) probably will. The weather controllers certainly possess the technology through a variety of installations similar to HAARP (High Frequency Active Auroral Research Program) in Alaska, as well as an enormous military jet capability that are retrofitted to deliver chemtrails 24/7 virtually anywhere. The military component of this ultra-secret geoengineering program basically has access to every civilian airport, Air Force base, Air National Guard airfield and private corporate runway in the Western world. That’s how they have been able to deliver so many tons of aerosol chemicals into the stratosphere for many years. The explanation above (The Back Story) does speak directly to the exploitation of an evolving global climate catastrophe. Where at first it does appear that they intended to alleviate and slow down the GCC, they appear to have finally taken full advantage of it in order to advance various schemes such as U.N. Agenda 21. 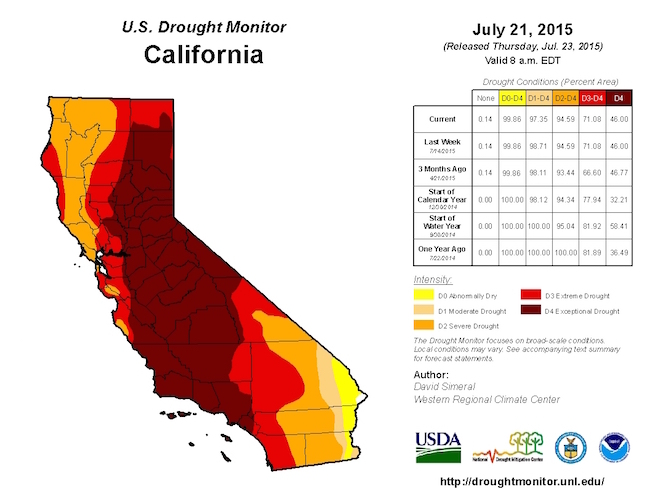 TPTB were not content to wait for the natural climate changes that had already been set in motion. Rather, they took full advantage of the worsening predicament in order to impose a whole New World Order complete with its own evolving One World Government. 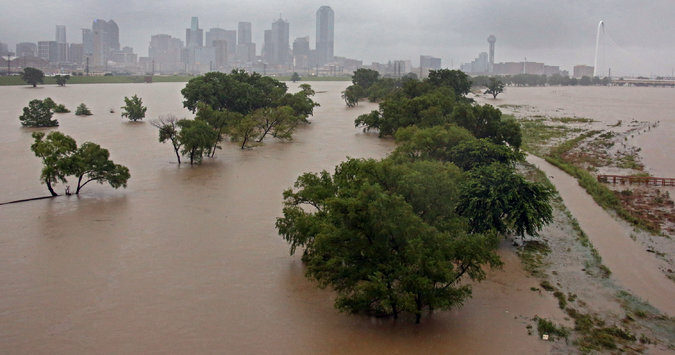 Please understand that we are all for sustainable development in a world that is not assaulted and assailed at every turn by extreme weather events. However, to construct a new Global Carbon Control Matrix based on an overarching climate change prediction model — which excludes geoengineering — is fatally flawed, and therefore destined to fail. It is for this reason that we are writing this letter. GEOENGINEERING must be acknowledged by every institutional stakeholder and then removed altogether from the mix, if GCC is to be correctly dissected, understood and responded to effectively. It is also for this reason that we implore you to take a close look at the volumes of new scientific evidence that now exist on the internet which correlates regional climate changes to relentless geoengineering operations. The two most recent catastrophic weather events in the USA bear remarkable testimony to these now common correlations. What follows are two essays that further elaborate the key point we are making with this letter. What else can be concluded from a letter like this except that all future climate change conferences must include a decisive discussion of geoengineering if they are to be taken seriously? Also, that all atmospheric engineering must be terminated post-haste, if the world is to experience the most natural weather patterns and genuine climate trends. Otherwise, all the much-needed discussion is leaving out what may be one of the biggest causes of Global Climate Change. Your Holiness, it appears that you really want to do what is right for all of humanity. Your sincerity of purpose in addressing the climate change dilemma is likewise much appreciated by the peoples the Earth. However, given your M.S. in chemistry you know full well that the universe is a divinely ordered one. It strictly adheres to numerous natural laws and universal statutes, just as it abides by countless scientific formulas and mathematical equations. Therefore, we beseech you to take a hard look at GEOENGINEERING, particularly as it has impacted Global Climate Change. Failure to do so will inevitably sabotage any and all efforts to respond to GCC in any meaningful or successful way. May God Almighty shine much grace and shower many blessings upon you. P.S. The exclusive emphasis on CO2 limits and carbon emissions has done a great disservice to the public discourse which strives to address the root causes of GCC. Those who have pushed that agenda appear to represent the same interests who advocate a surreptitious geoengineering regime. There can be no trust from the people of the planet until this situation is legitimately remedied. P.P.S. Your Holiness, on May 24th of this year you issued the unprecedented encyclical letter LAUDATO SI’ — ON CARE FOR OUR COMMON HOME. This extremely urgent papal call to action was both inspired and inspiring. May we suggest that there is no greater initiative, that the entire planetary civilization can take at this critical moment of human history, than removing the geoengineering component from the unfolding Global Climate Change calamity. After all, geoengineering is by far the easiest of all the GCC anthropogenic factors to control, as well as to terminate. In so doing, you can be highly instrumental in assisting the world community of nations to “Care For Our Common Home”.